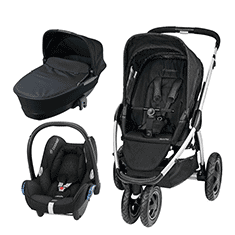 Includes: Pushchair, Carrycot, Duo Pod, Bag, Parasol, Clamp, Carseat and Isofix Base! Now with over 60 modifications the New iCandy Peach in Indigo offers superb style, functionality and versatility. Suitable from birth, the seat unit is now larger than previous generations, holding up to 25kg. The new iCandy Peach Carrycot has been constructed to appear clean and minimalistic while offering a warm and snug space for your little one to enjoy nap time. As baby grows out of the carrycot, the fabrics can be stripped away from the carrycot frame using an innovative “zip in, zip out” design, transforming the carrycot into the seat unit. The seat unit provides ample space for your little one to grow. The adjustable calf support ensures baby is comfortable at all times while two handy storage pockets on the back of the seat unit keeps essentials close to hand. The four position recline can be adjusted using just one hand, whilst the brake is now purposefully located off centre, making it simple to access when using the pushchair in double mode. No need to buy lots of accessories, iCandy have evolved and combined the footmuff and seat liner to create the Duo Pod. The seat liner is fully reversible and boasts a soft touch fleece on one side and a cooler textured fabric suitable for summer months on the other. When the weather gets colder a front section can be added to the liner to create a footmuff keeping your little one warm and cosy. The ready-to-wear collection finds inspiration in classic modern design, reinterpreting iconic iCandy detailing and designing with practicality in mind. Understanding the needs of the modern day parents the launch of ‘The Bag’ collection combines 84 years of experience within the nursery sector with impressive design and fashion credentials, and iCandy, understand the importance for today’s parent to express their individual style whilst adhering to the practicalities of being a parent. The bag is a large, structured changing bag designed to hold all everyday essentials. The universal colourways ensure there is an option for every iCandy customer. The stylish textured fabric matches the fabrics in the current range, meaning a parent can now match their changing bag to their iCandy pushchair. The exterior zip pocket ensures your valuables are secure and always close to hand. The two elasticated, handy end-pockets are designed for those small items, ranging from car keys to cosmetics. The durable, wipe clean fabric completes the must have functional style. The two large internal compartments and the elasticated pockets are ideal for nappies, and help keep your iCandy Bag organised for everyday use. The bag also includes a changing mat, and features an adjustable shoulder strap. The iCandy clamp is necessary to attach your cupholder or parasol to you Peach Pushchair. A one-pull harness adjustment ensures its correct tension. As your baby grows the harness and headhugger can be altered to ensure that it is always positioned correctly. The CabrioFix offers easy installation with Maxi-Cosi’s range of click-and-go base units and can also be installed using the car’s three-point seat belt. After your child is born, naturally you want to take him or her along with you in the safest, but also most comfortable manner possible. When used together with the EasyFix Base, the reliable Maxi-Cosi CabrioFix is a safe and easy way to transport your child by car. Simply click the Maxi-Cosi CabrioFix onto the EasyFix Base and you re ready to go anywhere. Maxi-Cosi EasyFix Base makes it quick and easy to install the Maxi-Cosi CabrioFix infant car seat Works with either the IsoFix connection points or car s three-point seat belt. Belt tensioner to ensure secure installation. Colour indicators to confirm correct fitting. Works with either the IsoFix connection points or car s three-point seat belt.